How many followers have been lost by the Gulf’s Instagrammers? This week, photo-sharing app Instagram removed millions of accounts believed to be posting spam. The action, which has been dubbed the “Instagram Rapture”, hasn’t spared Instagrammers in the Gulf. Instagram is popular in the Gulf, particularly in Kuwait, where some Instagrammers have become celebrities in their own right and have turned the application into a living. Globally, many of the world’s top 100 Instagram accounts have been hard hit by Instagram’s move to delete fake accounts. Figures released by developer Zach Allia have revealed that celebrities such as Justin Bieber lost over 3,500,000 followers. So, how did our own Instagrammers do? For Kuwait, stats compiled by the website Kuwaitiful compare numbers before and after. 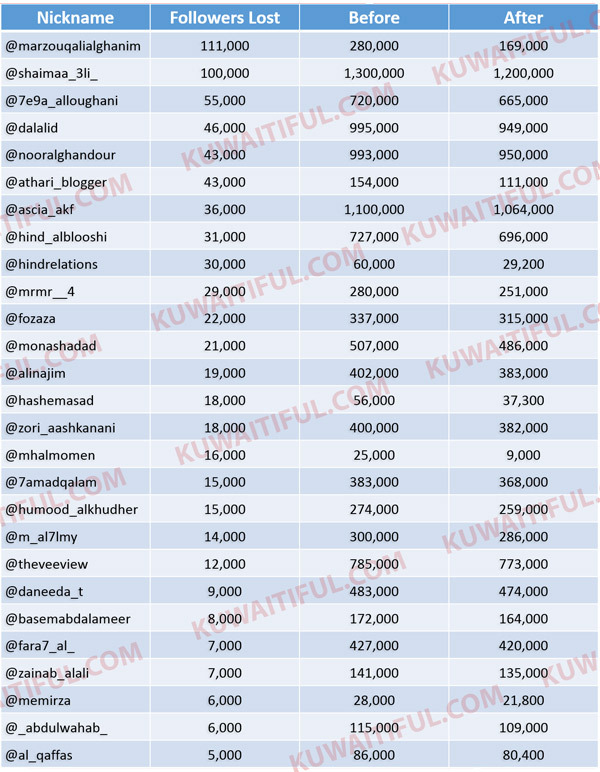 Have a look below at the top accounts in Kuwait (not all are Kuwaiti based, mind you). For Saudi and the UAE, I’ve gone to Social Insider which also compiled the numbers before and after. Again, we’re seeing a similar picture, with some accounts hardly affected, while others have lost a double-digit percentage of followers (apologies for the image size, but you can zoom into the image to read the numbers). The reaction from celebrities in the US hasn’t been kind. Rapper Ma$e, who lost more than a million followers, deleted his account after being accused for buying followers. 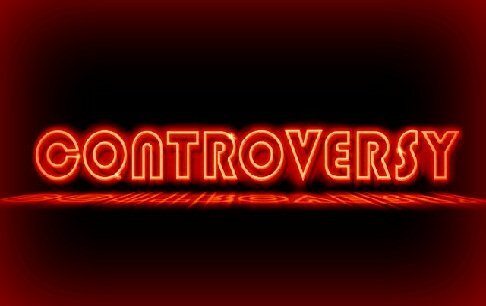 How will those celebrities in our region respond, especially the accounts which have lost over ten percent of their total follower numbers? Also, will this affect how much these Instagrammers are charging for posting paid content? It’d be interesting to hear your thoughts on this one. A short but fun post for you. Saudis love their cars. And they love their desert driving. A typical weekend in Riyadh will involve a drive off the tarmac and into the desert. Here’s what happens when two of Saudi’s favourite past times come together. Enjoy the video and remember, don’t drive the Bentley into the desert. I often get asked about Saudi Arabia, about its people, customs and culture. But every so often you can get a glimpse into this magic kingdom and enjoy a peak at the real Saudi. Last week, on the 10th and 11th of December, the Saudi Center for Women’s Studies held a conference on women’s rights and responsibilities. For the first time I can remember for such an event, it was streamed live on the internet, including with commentary in English. While I’d love to have a peak at the number of unique users on the site, social media activity in the Kingdom surged during the two days. Writing with the hashtag #womanforum Saudi and Arab nationals shared and commented on the views presented by the speakers (as this is Riyadh/Saudi women speakers did not share the same hall as the men and so were not visible in the video if you were wondering why there seemed to be no women at a women’s conference). Most of the tweets and updates were in Arabic, but others did post in English. The organizers of the event even used Facebook to upload pictures of the event and the speakers involved. If I can dig out the link I’ll add here. Several days later in both English and Arabic media articles were published on the event. Here’s the link to the Arab News story, and the other for the Saudi Gazette piece. While the media did pick up on important aspects of the event, the pieces were published several days after and lacked both the immediacy of the social media feeds as well as the cut and thrust of the debates online. With Saudi women and their rights being such an important topic in the Kingdom today, you’d have to ask if one article in a newspaper could do justice to the entire event. As an addition to the above much of the argument for Saudi women working has been waged online. This is one video that was circulated this week using the womanforum hashtag. The video was uploaded in March but was circulated again this time round due to the renewed focus on women’s rights and work in Saudi. There’s nothing like a viral conversation, even in the magic kingdom.